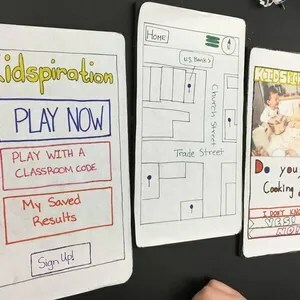 A group of students from West Salem High School is one of four nationwide winners of an app-building contest for their idea that would help students find a career. help young students better find careers they will enjoy and also find people in the local area to help them get there. Jonathan Fredericks, 16, Lucas Plaisted, 14, Madison Plaisted, 16, Kara Warkentin, 15, Emma Fagan, 16, and Ty Brewen, 16, found out Tuesday they won “Best in Nation” for their app in the Verizon Innovative App Challenge. Each team will now have the opportunity to work with MIT professionals and turn their idea for the app into a working product. Additionally, each team will receive $20,000 for their school and an all-expenses-paid trip to the TSA Conference in Nashville, Tennessee, in June. The app starts by taking the kids through a fun, interactive career aptitude test, Brewen said. Once the students see their job recommendations, they are given a map of nearby locations that do what the student might be interested in, further connecting them with resources, mentors and opportunities to explore the job. West Salem Principal Ken Philips said he is in awe. “I learn every day from these kids,” he said. The students, who were surprised during their lunch hour by a handful of administrators, Verizon representatives and members of the media, were excited, but a bit shocked. “It’s all slightly unrealistic,” Madison Plaisted said. Brewen said he is “really pumped” as they start moving forward with the creation of the app.